drls in the corners of the lamp blocks in the lower grill and which takes a really stupid and difficult to replace bulb (t20 wedge i think) which in any case has case I see no need for and in fact I think are just a menace. Due to the age of my car although they have to be fitted by law when new, they dont have to work afterwards as MOT test dont require testing of drls on any car made or first used before 1 march 2018 and for this reason i am considering several options to decrapify then. I suspect this is another question that only cicolo / ciclo can answer but any replies are welcome unless i get stufff like "er why bother ,it naughty and other opinionated stuff. Im only asking about the tehnical possibilitys and while i am interested in remaining road legal, ultimately im not trying to make this other peoples problem. Option2 is to replace the lamps housings for some thing that takes a ba15s type bulb like I believe the pre facelift (smiley ones) did using bulb holder number 6r0953123a because ba15s bulbs come in all sorts of sizes and previous tests show that my bcm does not complain when I use bulbs as low as 5w. Can anyone recomend me a Drl enclosure which take ba15s bulbs (i dont have or need foglight currently) of the angular type which will fit post facelift polos either oem or aftermarket? This solution would reduce confusion and glare and menace factor to other road users without needing to alter the cars settings. Option 3 The bulb holders on the current drls lighting blocks look suspiciously similar to h8/9/11 bulbs has anyone tried this and if so which one fitted the best. The reason im asking is because some of these bulbs are A more optainable than the current peanut bulbs and B some of them I think can sometimes be bought in 24v versions from truck places which will obviously be nice and unobtrusive at 12v and should still draw enough to keep the bcm's bulb failure system happy again with no modifications plus undervolted bulbs last a long time. IMHO the Germans do extraordinary things, like many others on this planet in this exciting 21st century. I don't know if your current BCM is capable of managing the DRLs so that they are permanently lit in all switch positions (without IC faults). Being a 6C maybe the Germans already thought previously that you would want this condition for your DRLs. Do you have any kind of diagnostic tool? VCDS autoscan? The 6C is not my territory, I hope someone can help us in this matter. I think it's better that you make your question in the 6R/6C section. I've DRLs on my own 6C and, like you, regard them as a bit of a pain in the proverbial backside; apart from on gloomy winter days, they're a dreadful waste of energy, IMHO, and I find it particularly annoying that they're on when the car's parked and you're in the car listening to the radio or whatever. I nevertheless accept that, rightly or wrongly, they're now required by law, and although mine are the non-LED types I've no intention of ripping them out and/or replacing them. A year or more ago, I came across a legit method of disabling the DRLs, it not involving any physical disconnections. I think it was published somewhere in these forums. Anyway, it would satisfy your Option 1, I feel sure. I'm not convinced you'd still be road-legal if you disabled yours, though. I've a record of that procedure somewhere and could re-publish it in this particular Topic, if you wish. There is a setting where you can disable the drl lights when parked. Thats how mine work after I did the adaption. Veteran Due to the age of the car DRLs are currently not a MOT requirement on any car first made or used before 1 March 2018 even though its new enough to require them to be fitted as new. Your right in thinking some one could whine and winge or bring that date forward in future and this is why Options 1 and 2 are my favorite because one can quickly reconect it all or change bulb size etc with out having to mess around with un-neccessarily complexity each time i think the do-gooders are close. Massimo23 I once did borrow vcds and I think the setting you are reffering to is the one that turns the DRLS off when the hand brake is applied. Usefull if you sit in car parks in winter time keeping the car warm radio on etc, However its not so helpfull as the car would tend to roll away when checking the lights from outside making lighting the least of your problems! Its this kind of ill thought out EU meddling/do-gooderism which is why I voted "LEAVE" because all they do is cause problems for the rest of us! I solemnly promise that I haven't moved this thread to the 6R/6C section, and that I would never have done it. It is highly probable that it has been moved by iichel. By the way, although the 6C is not my territory doesn't mean that I don't have extensive knowledge of this model. I beg a little respect in the ways of saying things, this a international/world forum, I wouldn't want to be forced to show my power. Thank you. Its perfectly acceptable for my post to be moved from the wrong place to the right place as long as they can be found and I know where they are. Regretably I dont have current use of vcds. Also I dont have the 5 digit code BCM which one needs for changing certain settings at present. To give one a clue to narrow it down what bcm I have Ill describe the feature best I can. 2 door , Electric windows, bluemotion stop start system, Uses a real key not a remoteflipper (and I dont believe one can be programmed in either), proper light bulbs (not an led anywhere) non electric mirrors with led repeater, no extra lights exept rear fog light, daft radio which also does things it shouldnt like control the car, tpms, abs, esc (via daft radio). All the lights have bulb failure monitoring exept numberplate and reverse lamps. From this you should be able to narrow down what bcm I am likely to have to a couple or so models?? To my way of thinking, as one starts to turn the light switch round it should get bighter and brighter with each position click. Seriously though are all european cars quirky/stupidly thought out? do I have to go back to buying a rust bucket from ford or what? A couple of points: First, I think I'm right in saying that the Law's requirement for DRLs, if fitted, to be operative while the car is on the road has, of itself, little to do with the satisfying of an MOT requirement. Second, although there might be a method for temporarily turning off the DRLs by using VCDS (such as mentioned by massimo23), the solution that I myself remember seeing does not (if my memory serves me correctly) involve VCDS. If you just give me the time to find the note I made way back about this, I'll post the solution here. Do appreciate, though, that it's a method where the DRLs are permanently disabled. Are you saying that even I could pass the MOT i might still get trouble from the police and similar highways authorities? 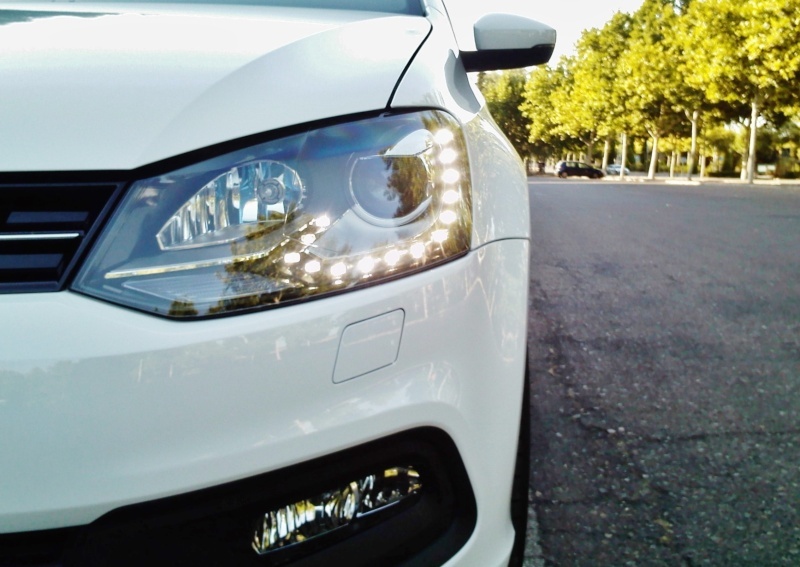 The DRLs function is like an altruistic favor that you do to others, so they can see your car with clarity (that's why they are more powerful than the side/parking lights). In no case are oriented to help the rest of the lights in better lighting, nor to drive exclusively with them during the night under any circumstances. As you already know, also under no circumstances (except in the Scandinavian countries) it is allowed to drive exclusively with side lights. Typical pedestrians who are deeply focused on their smartphones looking at essential things for their lives and cross the zebra crossing without looking if it is possible to do so. It's proven that DRLs save lives. IMHO, it would be good if you also did this altuistic favor to others and you rethink the way you want your DRLs to work. In response to your question Idriveapolo, yes! 1. Insert the key in the ignition, but don't turn the key at all. 2. Turn the headlight switch on the RHS of the dashboard (this assumes a righthand-drive car) to the '0' position unless it's already there. 3. Operate the direction-indicator stalk as if to turn left and then pull it toward you, as if to do a flash. 4. Turn the ignition on, but not the engine. 5. Wait at least 4 seconds and you should then hear three beeps. This will indicate that the DRLs have been deactivated. Check that they have. Please understand that if you decide to try this out, you do so entirely at your own risk. Don't come blaming me if it doesn't work. I've never tried it out myself. Bear in mind that it's not known how to re-enable the DRLs, should you ever need to (though I guess there must be a method). I'd strongly advise that, before you attempt this, you do some research online yourself to determine what the Law says about using DRLs in the UK. My understanding is that if DRLs are fitted they must be on and fully working while you are driving around. veteran ive already tried that one, only works on earlier models. ciclo In my way of thinking and many others in the uk, if somebody insists on not looking where going then they probably need knocking over. Also this idea of being seen and creating some kind of competition on who can attract the most attention blurs the lines of responibility which is dangerous in itself. For example if some one wants to cross the road whos responsibility is it that they dont get run over? The idiot not looking or the motorist for "hiding" from him. Also when im driving along the road and see some one in the middle do i brake as I did before or do i say to myself "he will see me coming because ive got daft lights fitted?" (dont forget its also dangerous to brake uneccessarily in case the person following you playing with some dashbord accessory or phone etc, becuase after all hes got air bags, abs, radar, you name it and many other excuses for being divorced from the realities of driving) . Besides what are we all to do at night time about animals that escape on the road, pedestrians, cylists, potholes, and all the other unlit risks on our roads how does a culture of "lights solves everything" deal with all that ? Will the farmer be required to put leds on all his animals just in case they escape and what if the batterys go flat in the mean time? Its because of all this ive had to give up cycling due to the fact one can no longer guarantee the motorist is even awake whereas before one could cycle quite safely knowing the biggest distraction any motorist could have was turning a cassette tape over! This is serious! The more excuses we make for dumb people the dumber they will get and this emerging culture is more dangerous than people realise. As some one who is spanish you have probably seen our drunken louts embarassing both themselfs and my country on holiday. This is because Uk authorities always pick up the pieces and let them getaway with it instead of giving them a good kicking and so of course they think they can do it elsewhere. This whole culture of passing blame onto other people is far to prevelant. In the uk one can drive with sidelights A in the day time whenever they like B in built up areas where there are street lights and some still do though far less often than in the past. In the 90's The uk government decided that that dim/dim lights (town lights) should be fitted to cars to increase ambient lighting and visibility of drivers who considered main and dip beams to be too powerful to use in built up areas like so as not to shine through peoples windows and the like. These would often light up the main or dim filaments either at a reduced intensity or could use a seperate filament as one wishes to design it and only worked when the engine was running and sidelights were on and were of similar intensity as many drls today. This idea was too sensible for those in brussels so they took our government to court and this requirement was dropped because the car manufactures complained that they would have to make our cars differently EVEN though our cars already have to be completely redesigned anyway for the simple reason we drive on the other side of the road IE new dash board, pedal assemblys and linkages, spedometers showing mile instead of kilometers, lights already having to be made to not dazle cars passing on the other side, wiring looms changed to reposition the controls and even carpets and footrests and other stuff too. Well, I'm (already was) absolutely convinced that your last comments are full of truths. I'm also convinced that a diagnostic tool such as VCDS (for example) would solve part or totally this issue. I don't know if the bulbs holders 6R vs 6C are compatible between both types of fog lamps 6R vs 6C. The connector that go to bulb holders is the same for both 6R vs 6C. If this is possible, there will be many more possibilities for DRLs 6C. Must be investigate the BCM coding and adaptation channels.